China's swelling demand for oil and gas for domestic consumption and heavy dependency on imports makes it one of the most lucrative markets for the global oil and gas industry, according to GlobalData, a leading data and analytics company. The company's report: ‘Impact of China on Oil and Gas - Thematic Research' reveals that to achieve the dual objective of reducing carbon emissions and ensuring energy sufficiency, Chinese oil and gas companies are gearing up to expand their reach and lend financial as well as technical expertise for projects around the world, especially in projects related to natural gas. 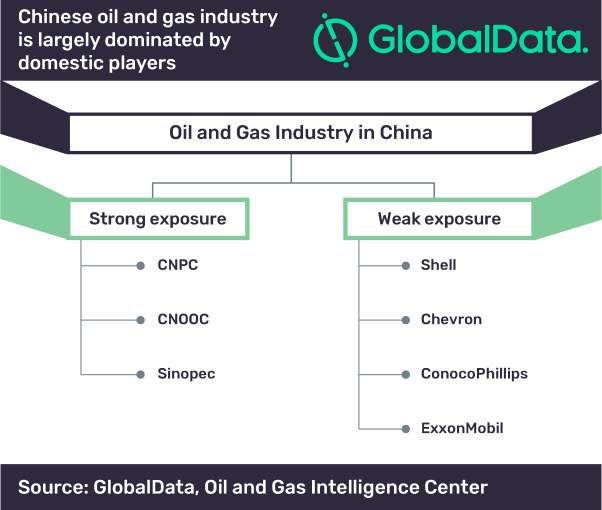 GlobalData's thematic research identifies China Petrochemical Corp (Sinopec Group), China National Petroleum Corp (CNPC), and China National Offshore Oil Corp (CNOOC) as some of the companies that have strong presence in China's oil and gas industry. Shell, Chevron, ConocoPhillips and ExxonMobil are some of the non-Chinese companies that have weak exposure to China. Sinopec, CNPC and CNOOC together account for around 75% of crude oil production and refinery and petrochemical throughput in China in 2017. Sinopec and CNPC are among the largest oil and gas companies globally and ranked first and third, respectively, in terms of annual revenues in 2017 while CNOOC ranks among the top 20 global oil and gas companies. After dominating the domestic market over the past several years, Chinese oil and gas companies are now expanding their overseas presence to diversify into new markets.